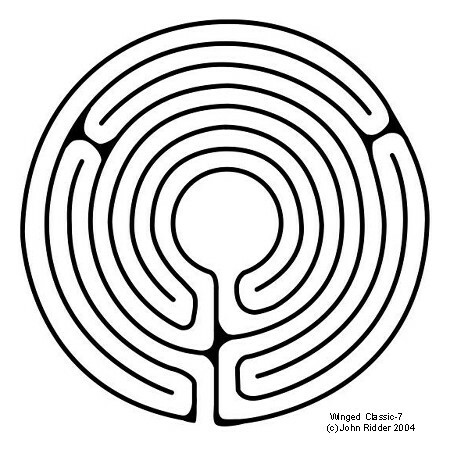 The Classic 7 labyrinth (Cretan) is found in many cultures dating back over 3,500 years to the Island of Crete. Many examples are found throughout the world in petraglyphs, clay tablets, coins and stone constructions up and down the North Atlantic coast. Its simplicity and egg-like shape give it a unique, inviting character. It is often created in concentric or modified patterns. 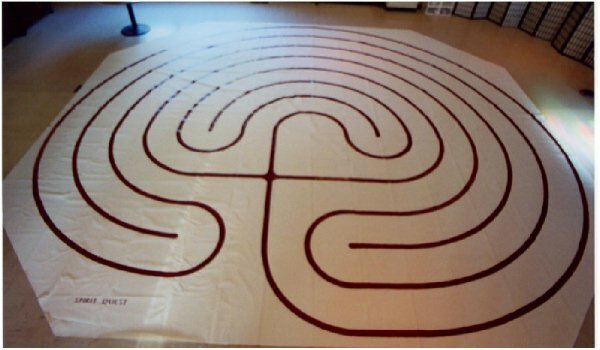 Our Classic 7-circuit labyrinth is offered in standard widths from 18 to 36 feet at the widest measure. You can choose a left or right entry path. Customized labyrinths in a variety of sizes, colors and materials are also available, contact us with your needs! Churches and Retreat centers often have odd-shaped rooms, so the smaller you go, the more locations it will fit. We don't recommend smaller than 12-inch paths with any of our labyrinth designs. In the 18-ft one, the paths would be about 13 inches, in the 24-ft about 17 inches. The 36 ft size the paths would be about 26 inches wide. Another consideration is how many people will be walking at once. The classic7 has a smaller center than the Chartres style designs, So we make the center slightly larger. (standard is two times the path width.) Our smaller 18 ft size limit of comfort is about 9-12 persons. The larger 24 ft size can handle up to 15-19 persons. The Colored Poly Canvas costs a bit more because of the extra labor to sew more seams and paint in two coats. We can also (for a charge) do custom treatments, like multiple colors, vines, rocks, etc. In canvas, we can paint lines any color you choose of common latex paint. the poly-canvas comes in many darker fabric colors , so be creative! Classic 7 - 36 ft; Canvas $2,500;. 33 ft Poly Canvas, $2,900. Classic 7 - 30 ft; Canvas $2,300;. 28.5 ft Poly Canvas, $2,700. Classic 7 - 24 ft; Canvas $1,800;. 23.5 ft Poly Canvas, $2,100. Classic 7 - 18 ft; Canvas $1,500;. 19 ft Poly Canvas, $1,800. Also available: polycanvas in colors! Due to the extra labor, polycanvas is more than canvas prices . Includes: one color of paint for the lines, a storage container & FREE shipping to continental US. also available ; Concentric, Custom, Triune7 Winged-7, Focus-7, World Peace designs.